FathersConnect Newsletter. A bi-weekly email publication which focuses on solutions to challenges we fathers face. Free. 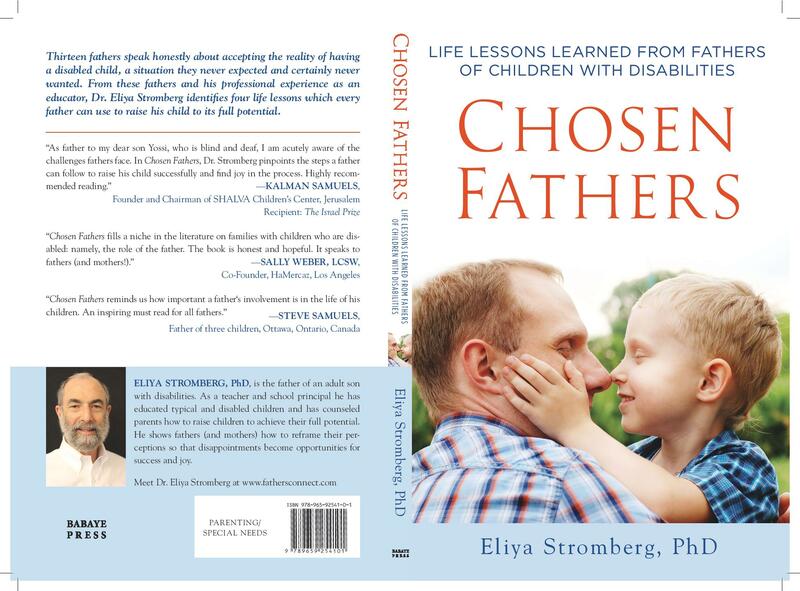 Receive it by emailing me at eliya@fathersconnect.com and request it. Chosen Brothers, Chosen Sisters: Siblings of Disabled Children Speak Out. Challenges and solutions to the issues facing siblings of a disabled child. Ebook, CD, and workshop to be available Spring, 2017. Sometimes what a father needs is to Reframe so that he sees his situation from a different perspective. Once he does, solutions to his challenges are easier to find. I will teach you how to Reframe. •	Once you learn this skill you will be able to apply to any situation that challenges you. Eliya helped me to take a more active part in encouraging my son to actualize his potential. Thank you, Eliya, for helping me to become a better father to my son. My wife and I were not a team. Much of our interaction left me frustrated and angry. Eliya showed me how to reframe our interactions. I learned to acknowledge her point of view, to let her know that I hear her. I learned also how to say: “I have another way of looking at the situation. Let’s find a middle ground.” By working with Eliya in just a few sessions I was able to push back my tipping point. Interactions with my wife improved which helped us deal with family matters in a more productive way. Thanks, Eliya. Marc B. Very recently I was confronted with a very difficult career choice. Eliya gently guided me through my different options, stacking up the pros & cons until my best choice became clear to me. I’m sure there are others who could have helped me, but Eliya was very, very quick in helping me reach a resolution which is why I’d recommend him as first choice. Ra’anan E.
I benefited from Eliya’s coaching expertise for nearly a year. His sensitive listening abilities and deep insightful comments help to guide me on the path I wanted to take. I highly recommend Eliyah to anyone longing to reach goals and realize his potential. Chaim W.
The five weeks course has been of great help to me and my wife. I loved the interaction and the frankness in which we dealt with various issues. Our daughter at that time did not want to talk much except in her own little baby language. We believed she had it within her to talk and through the various suggestions coming from the group we decided to push our daughter to ask for what she wanted. And thank G-d, it worked and she is now communicating in a very effective way even with her limited vocabulary. Yochanan. My message is simple: This is your life. Accept it. Get busy and make it good. Here is a sample of my speaking. The venue was an audience of parents of children with disabilities in Johannesburg, South Africa. The date was 18 September 2016. Click here to hear the speech. Upcoming events are in London, England on 28 February 2017, sponsored by The Norwood Organization and 1 March 2017, sponsored by InTouch of Stamford Hill.